I picked up this little puppy a few days ago on Ebay. 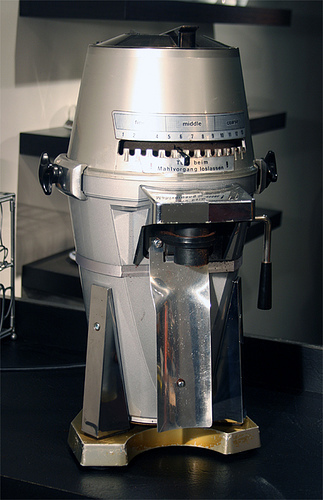 It's a coffee grinder made by Mahlkönig in Germany and is nothing less than a beast. Weighing in at almost 100 pounds, I had to put in an additional 220 volt circuit to accommodate it. But does it ever grind… it chewed its way through a pound in 10 seconds flat. My other shop grinder takes at least 45 seconds to accomplish the same thing. Don’t expect to see it at the market though; this beauty is strictly for in-house use.